Joshph Henry published the idea making a tight winding of insulated wire to form electromagnets. 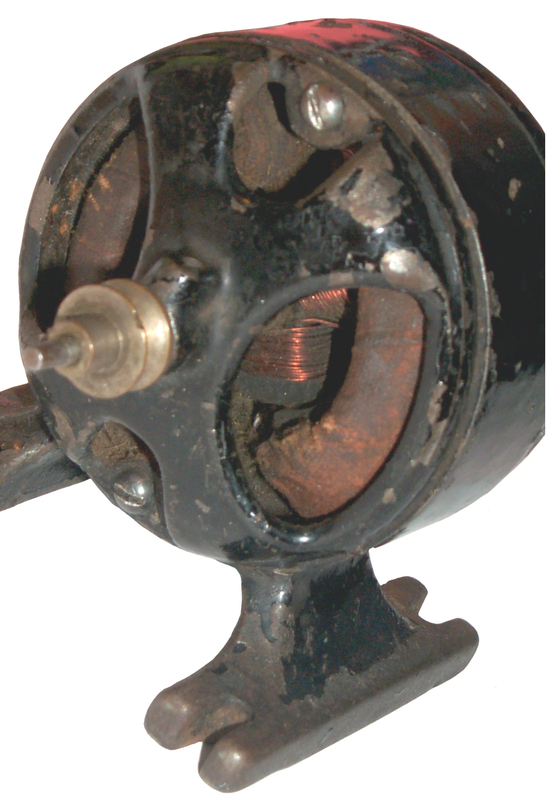 William Sturgen combined that with a Commutator to make a rotary DC electric motor. He made a two pole motor that needs a manual spin to get started. By using three poles the motor is self starting. Sturgen's electromagnet used bare wire and so had a small number of turns and required high currents. It would not allow things like a telegraph since the transmission wires would be too big and expensive. The electromagnet by Henry ran from a much lower current and that allowed it to work at longer distances using practical wire sizes. DC motors are one of the logical follow on developments once you have an electro-magnet. An authorized interview with Alfred C. Gilbert, president of the A. C. Gilbert Co., New Haven Conn. Mr. Gilbert is amateur wrestling champion of his weight in this country, and incidentally holds the degree of doctor of medicines. Last year he sold around $1,400,000 worth of toys and by-products into the marketing of which he had put $140,000 in advertising. He started in business less than seven years ago with a capital of $1200, saved from money earned while working his way thru the Yale Medical School. He is now president of the Toy Manufacturers of the United States. Mr. Gilbert has concentrated on toys that bring into play considerable thought, study and practical imagination on the part of the boy purchasers. The Gilbert business began with Mysto Magic and then put out Erector and Briktor model toy building outfits, electrical and wireless devices. The Gilbert appeal has been keyed on"the fun of doing actual things the way real men are doing them." Mr. Gilbert in his college vacations had acquired a wide reputation as a sleight-of-hand magician on vaudeville circuits. He used to give classes in the mystical are, but found that his pupils lacked patience. So he used to invent simple devices and mechanical tricks which they could perform easily. When he first started his business, manufacturing the trick outfit Mysto Magic, he did the traveling among the department,hardware and toy stores, and was kept busy giving parlor magic exhibitions between Thanksgiving and Christmas. After a year or two in spite of a modest success, he foresaw an approaching point of saturation as far as Mysto Magic was concerned. So he bought out in 1913 Erector, a construction toy with many parts on which he holds certain patents. The best idea that can be given of the possibilities of the toy is that a boy, with the aid of a toy motor, made a working model of one of the Panama Canal locks. With the launching of this toy he started advertising, and with it came immediate success. 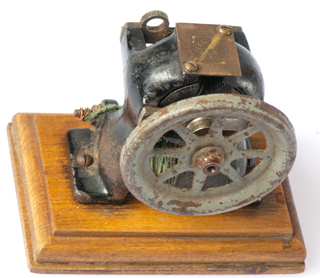 From the first appearance of Eractor in 1913 the company has made it a practice to give lists of prizes for the most ingenious models constructed with the toys. After the preliminary sorting a committee of real engineers judges the best models. In 1915 Gilbert started a bi-monthly boys' paper called Erector Tips. Some capital is made of boy hero-worship in an occasional article by Gilbert himself on such subjects as "How I became a world's champion athlete,", etc. In the 1915 contest some 60,000 models were submitted for prizes, so, as there were only 300 prizes, Gilbert knew there would be a great deal of disappointment. So he planned his Institute of Erector engineering, the courses of which confers three degrees, Erector Engineer, Erector Expert Engineer and Erector Master Engineer. To win these the boy must submit photographs of Erector or Briktor models. The Gilbert Co. makes a special arrangement with dealers by which they are given all the models and advertising material free of charge n addition to a certain amount of display, material, a model for window use, etc. In return the dealers just put the sign in the windows at least five weeks before Christmas: "Boys I will give these models away free to the boys who make the best models. All models must be brought to my store and displayed in my window before Christmas." Mr. Gilbert told the writer that he had been an omnivorous but careful reader of business literature - books, and magazines, clipping the important paragraphs for reference. In the book "The Man Who Changed How Boys and Toys Were Made" which is about A.C. Gilbert it's mentioned that this motor came with some Erector Sets and was an option for other sets. It shipped as a kit and the boy needed to assemble the motor. It was the first small DC motor. This is a three pole DC electric motor. Gilbert called it the P58. It was used in Erector Sets made between 1914 and 1936. The magnetic field the armature works in is provided by a filed coil instead of a permanent magnet. The field coil and the Commutator brushes are both brought out to thumb nuts. This allows for a number of experiments both in terms of changing the motors direction of rotation and in terms of driving the them from separate power supplies to see the effect of each. See the Links section below for a method of characterizing a DC motor. In the above photos you can see that the front and back sheet metal parts are identical although the front and back sides make use of different holes. It's usually less costly to make twice the quantity of one part than half that quantity of two parts. Note the cost savings does not stop at the manufacturing operation for the part but continues to storage, documentation, inspection, etc. The mounting holes are on a 2" square pattern and will clear number 8 screws. This matches the hole pattern in the Erector Set parts. The base can contain either a direction reversing switch or a switch that includes a slow speed position by switching in a resistor. 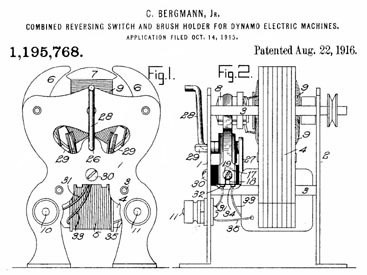 The first patent filing date is in the 1916 time frame and as late as 1923 this motor was being designed into new Erector Set toys. This motor uses cylindrical metal screen brushes which is a more advanced method than the sheet metal brushes that were used on the early DC motors like on the Electro-magnetic Toy engine and Weeden motor but not as advanced as carbon (Graphite) brushes. Problem As received the motor is non operational. The problem is somewhere in the armature where there's an open circuit on two of the pole coils, only one has continuity. This should be a straight forward repair, but we'll see since I've never done it before. Here's a photo after separating the armature from the field. The above photos are from eBay. 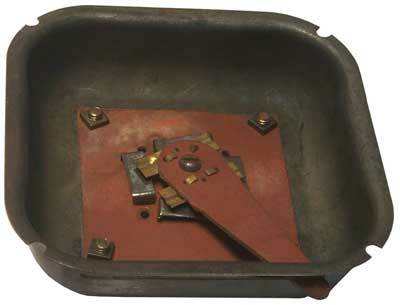 The field coil and electrical steel lamination can be seen at the left along with the brushes. 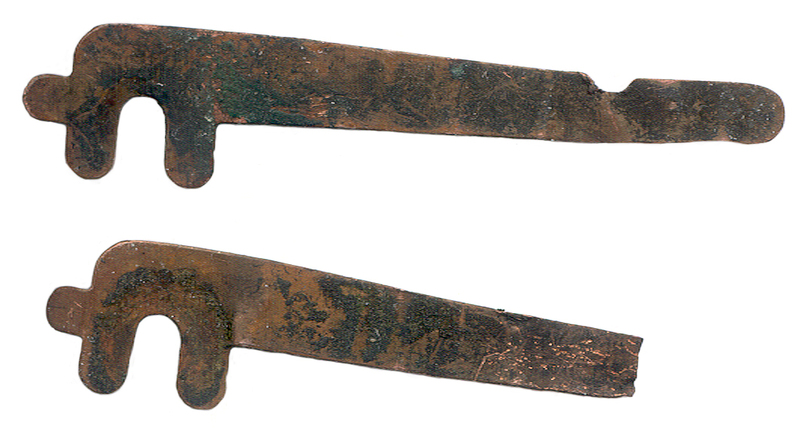 The four terminals and thumb screws are below the left image. On the right is the armature. On the frame facing the armature there's a circular mark about 0.35" diameter like a washer had been sitting or turning there. The pulley is a press fit on the shaft. The Commutator assembly is pressed onto the shaft which has serration's to keep it form rotating. With three coils there are six wire ends. 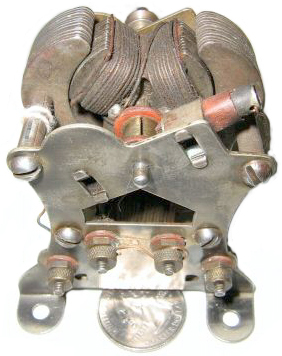 The Commutator has three sections. There are two ways to wire the coils to the Commutator. One way would be to run the two wires from a coil to adjacent Commutator segments which would result in two wires going to each segment. But this motor has only one wire going to each segment. The other way would be to connect one wire from each coil to a common point and bring out only three wires. This causes two poles to be energized in series when adjacent segments are under brushes. 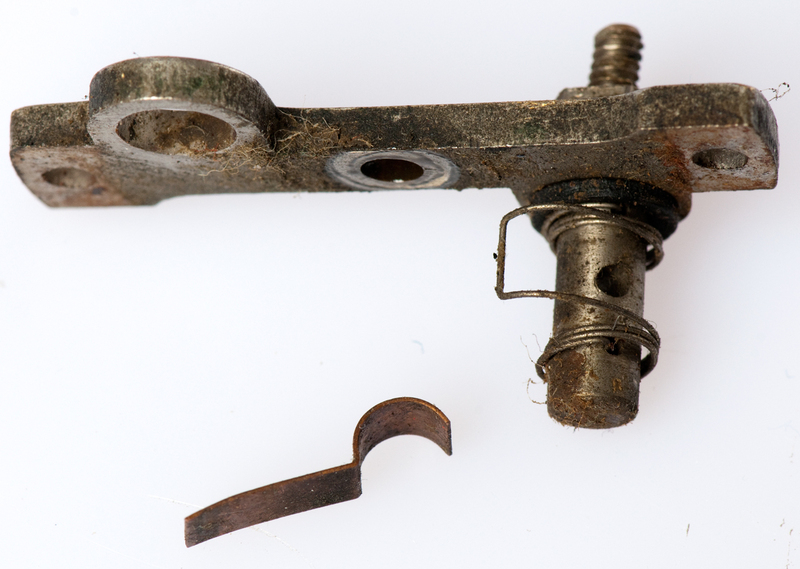 Using a sewing needle in a pin vise the cloth at the back of the armature was picked away revealing the three wires soldered together. Measuring the resistance from the common point to each of the commutator segments showed which coil was open and the other two were OK. A scale drawing was made of the armature and in particular the area were the coil is located. This made clear the direction of winding and where the start and end points were. If a splice was made there would be a big bump and also then the wire would be too short or there would be fewer turns so a new 24 AWG wire was wound. The wire was unsoldered from the commutator. At this point the resistance was double checked to make sure that the problem was not in that joint and to make sure this was the correct winding. After a couple of feet the wire was open. Then the rest of the wire was unwound. Rather than disturb the existing solder joint the old wire was cut off. A length of 24 AWG was cut from the spool by threading it and the old wire side by side using both pieces of old wire and then adding 12 more inches. After using a file to get the insulation off the new wire it was soldered to the common point and wound back onto armature. This was done under a stereo zoom microscope to keep the turns packed tight. There may be a few more turns since when the coil got the the ending point there was only 6 inches of wire left. it was cut to the proper length, a few turns unwound so it could be stripped, then rewound and soldered to the armature. An interesting discovery is that the brushes are not carbon rods as were expected, but rather a tight roll of very fine brass screen. Because of some slop between these rather short rolls of screen and the tubes that are the brush holders the brushes are better behaved when the motor turns one way than another, so the polarity of the DC was adjusted for that direction. The Red and Black wires are each 14 AWG super flex and have ring tongue terminals crimped on each end. They have extremely low resistance which I've learned is appropriate when working with this vintage electro-magnetic motors and No. 6 Dry Cells. The red parts are fiber insulating material sometimes called Fish Paper. It was also used in the motor as an insulator. The Gilbert motor uses a roll of wire screen, maybe brass or copper and the movable element (brush). 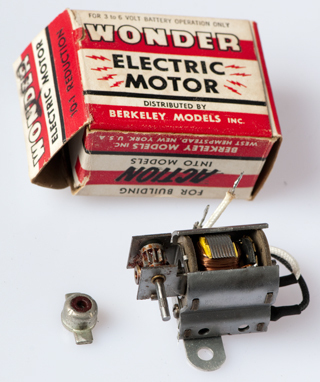 The Motor Kits use bronze wire as the brush. The small motor below, the 10-100 Demonstration Motor Generator and the Weeden use what's probably bronze sheet metal. 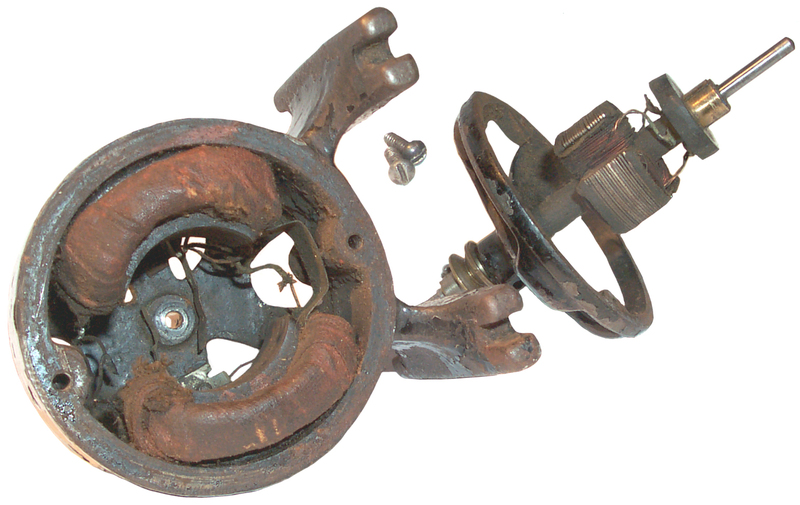 Modern motors use a brush that's made from a blend graphite and copper. By controlling the resistance the brush provides some spark suppression. 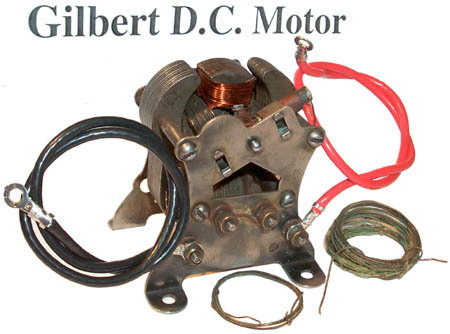 The Gilbert motor has the armature wired in a "Y" so that only one coil is in the circuit at a time. The same is true of the Electro-magnetic Toy Engine and Weeden. So when the power is removed from a coil there's a large voltage spike generated and sparking. The small motor below has the armature coils connected in a delta wiring. So the full DC voltage is across one coil and also across two other coils in series. When the commutator changes the voltage spike that would have been large is snubbed by the other coils. These motors only have 2 commutator contacts but other DC motors may have numerous contacts and numerous coils. How the coils are wired to the armature contacts is a very complex subject. In general G.E. which is related to Edison and DC motors and generators has most of the patents relating to DC rotating machines and Westinghouse which is related to Tesla has most of the AC motor and generator patents. RE14250 Toy Construction Blocks, Alfred C. Gilbert (A. C. Gilbert Co), Jan 16 1917, 52/634 - the Reissued patent has a change from Mysto Manufacturing company to A.C. Gilbert Co and a change in the patent classes. Top class 446 is Amusement Devices: Toys and 52 is Static Structures (i.e. Buildings). wind-up spring powered, fires compression spring powered torpedo when thrust spring runs down. 1492597 Toy Vehicle, Alfred C. Gilbert (A. C. Gilbert Co), May 6 1924, 280/248 - 4 wheel children's riding metal toy propelled by pumping a lever to and fro, but how to steer it? 1218076 Commutator, Alfred C. Gilbert (A. C. Gilbert Co), March 6, 1917 310/236- How the three brass segments are attached to the fish paper disks. 1219452, Toy Motor Installation, Alfred C. Gilbert (A. C. Gilbert Co), March 20, 1917, 74/414- Combines this motor with control switch and gearbox. 1307094 Electric Switch, Alfred C. Gilbert (A. C. Gilbert Co), June 17, 1919 200/11G ; 200/1V; 310/68A- Connects a battery to the motor and filed coil in either polarity or off. The motor can sit on top of the switch, like in patent 1219452 or the switch can be separated from the motor to provide a remote control. 1310613 Toy Gun, Alfred C. Gilbert (A. C. Gilbert Co), Jul 22, 1919, 124/29 ; 124/39; 124/49 - hand cranked fires two magazine fed rounds by action of spring. that the motor has a square mounting hole pattern and can sit on top of the switch (1307094). D58904 Electric Motor Casing, Alfred C. Gilbert (A. C. Gilbert Co), Sep 6 1921, D13/112 - two sheet metal cups joined at the open faces, closed design. a different way to make the switch in patent 1307094 using a cylinder like a commutator. 1445678 Rheostat, Alfred C. Gilbert (A. C. Gilbert Co), Feb 20 1923 [Filed Jan 28 1918] 338/215 ; 338/200; 338/234- This is for a fan and is just a power resistor that gets switched in to cut the motor speed in half. The rotating motor shaft can a offset disk that causes the follower to move in a circular motion, but not rotating. 1763302 Construction Toy, Alfred C. Gilbert (A. C. Gilbert Co), Jun 10, 1930, 446/90 ; 446/113- Cable drum and gears for crane, etc. 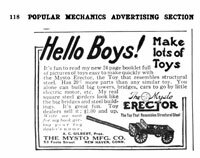 1736310 Toy Building Construction, Alfred C. Gilbert (A. C. Gilbert Co), Nov 19, 1929, 446/123 ; 446/103; 446/126- Erector set that looks and works like a steam engine. 2030201 Toy Locomotive, Alfred C. Gilbert (A. C. Gilbert Co), Feb 11 1936 105/37 ; 104/DIG.1; 105/108; 105/172; 446/447; 446/484- A locomotive that's made from Erector Set parts and uses this toy motor. 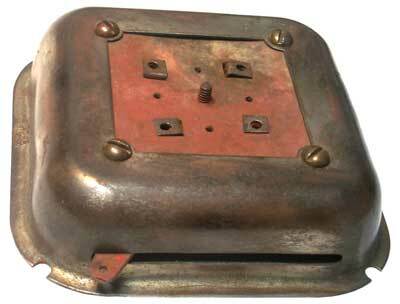 2154653 Battery Holder, E. N. Anketell, Apr 18 1939 429/97 ; 200/60; 362/120- a two "D" cell holder and on-off switch to power lights, small motors, etc. maybe to have something smaller than a couple of No. 6 Dry Cells. to produce alternately, telescopes, microscopes, projection apparatus, etc. I think that Gilbert bought out Knapp. I think this was intended for use in a small boat. The motor is a 3 pole design very similar to the Gilbert, only smaller. For 3 to 6 Volt battery operation only. West Hempstead, New Your, U.S.A. This is another small 3-pole DC motor. Missing one of the brush assemblies. prope aginst the brass screw. Bad news almost all the coils show open. 2 out of 3 bad in the armature and the field coil is OK. As shown above both field wires are connected to the right terminal, so measuring between the terminals shows open. But when the wire is moved to the left terminal the coil works. 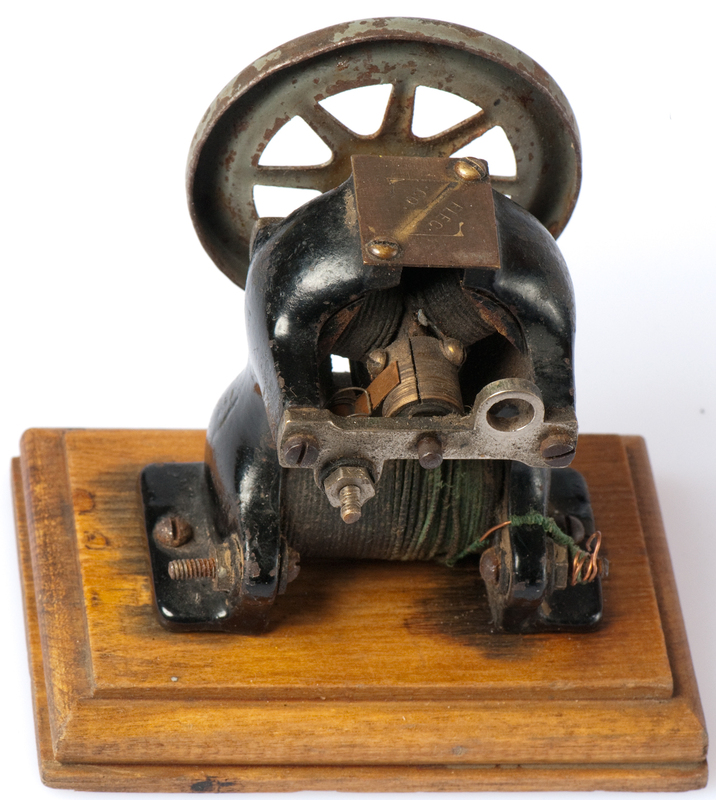 This may be a Gilbert sewing machine or small appliance motor. The shaft that's outside the pulley is tapered and shows signs of being used. 0.145 big end, 0.116 small end, 0.220 len. 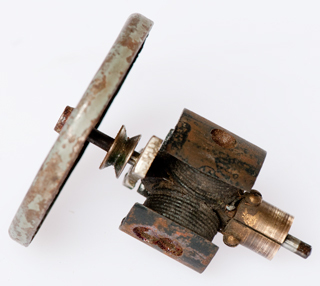 1195768 Combined Reversing Switch and Brush Holder for Dynamo-electric Machines, Carl Bergman Jr. (Knapp Electric and Novelty Co), Aug 22 1916, 310/219 - the motor looks very much like the Gilbert shown above with the new reversing switch and brush holder added. 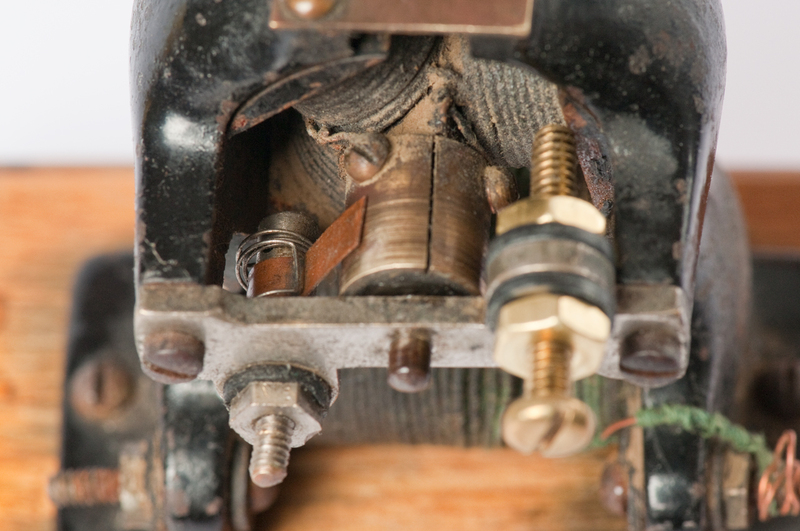 The armature has three poles just like the Gilbert motor above, that's why it's on this page. The commutator also has three contacts. The brushes are plain sheet metal, maybe brass and now neither brush is making contact with the commutator. Unlike the Gilbert above that has it's armature wired as a 'Y" this armature is wired as a delta, i.e. 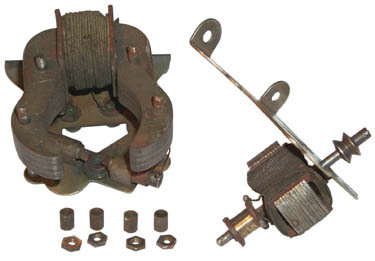 there are two wires going to each commutator contact. The field magnetic structure is very much like a more modern motor, i.e. 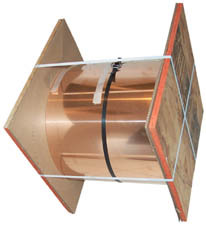 the field coils are thin and wound inside the circular shape of the barrel that completes the magnetic path. Like the Gilbert the armature is made of of Silicon electrical steel lamination. The motor is 2 7/8" diameter and it weighs 1 lb 13.5 oz. If you have any information about this motor please let me know. All three of the armature coils are OK, resistance: 0.269, 0,277 & 0.280 Ohms. The wire is 0.0135" over the enamel insulation maybe 28 AWG at 15.409 feet per Ohm. Wire length is about 4.2 feet. That's shorter than the Gilbert motor. The coil former is about 0.53 x 0.53" by 0.25 long. 24 turns * 0.0135 is 0.32", not a good estimate. It looks like 3 to 5 layers of wire on each coil. The two field coils are OK, resistance: 0.57 & 0.47 Ohms. The wire is 0.031", hard to tell if that's bare or over some insulation, maybe 20 AWG at 98.496 feet per Ohm. Wire length about 51.2 feet. If the average length of one turn is 5 inches there there would be about 122 turns. That would fit a square shape of 11 turns on 11 layers that was 0.34" x 0.34". The cross sectional diameter over the wrapping is 0.39" so this estimate is reasonable. There's a twisted joint that need to be soldered. 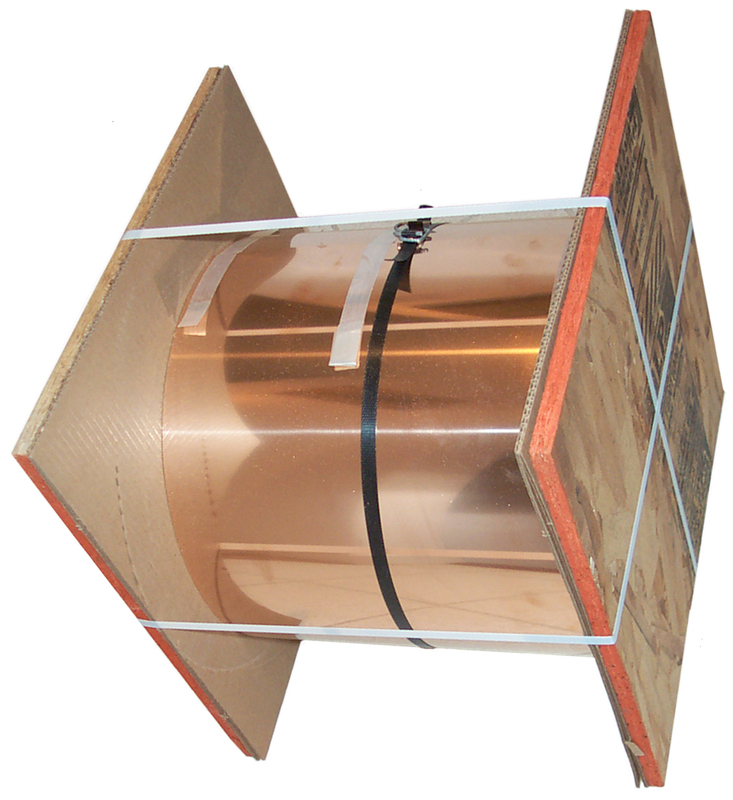 The central cylindrical frame is 1.000" long and the field coils stick out from each end. The center to center distance between the midpoints of the field coils is the same, i.e. 1 inch. In the height dimension the filed coils are curved so a c-c distance of 1.5" may be close. The brushes are made of sheet metal that should have some spring action, but have lost the springiness. One of them has a missing contact end. 4 May 2009 Installed the new brushes. By using a # 43 drill bit in a pin vise the slot for the mounting screw can be made deeper. That was needed to get a proper fit. 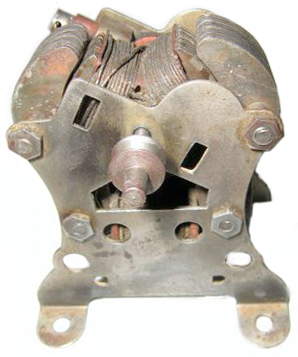 The motor runs, but does not start by itself which means the rotation of the commutator segments is not at the correct rotation of the shaft. See photo above showing the shaft removed from the motor. I made a few attempts by removing the shaft moving the segments and reinstalling. In some positions the motor locks up when power is applied and in others will run after it's manually started, but I haven't found the correct setting to get it to self start. There should by a way to do that other than trial and error. If you know how tell me. 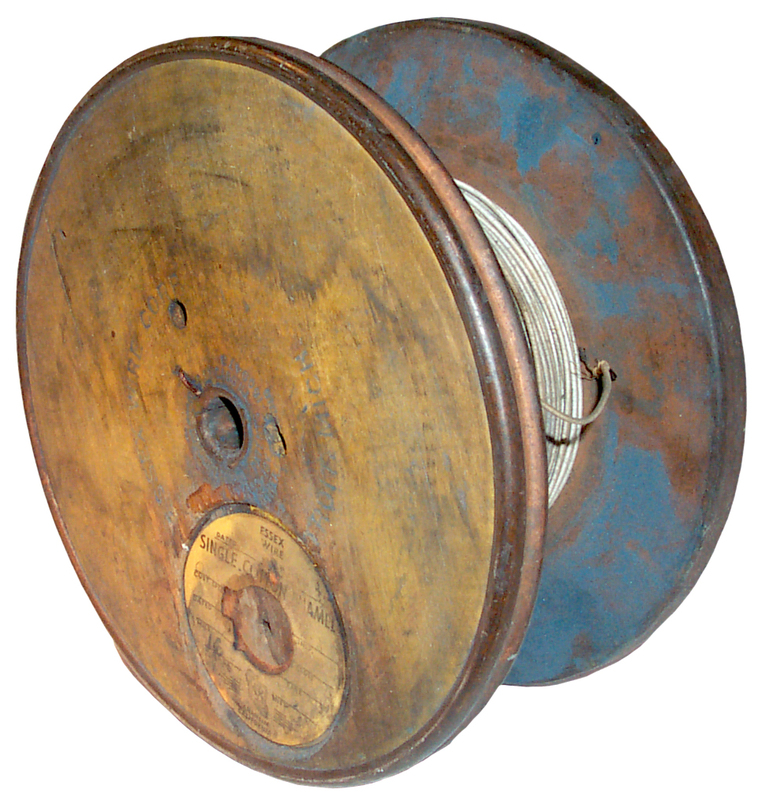 1365406 Spool, Eber J. Hubbard, Jan 11, 1921, 242/118.8 - A sheet metal & wood spool suitable for fine wire. 1609473 Spool, Eber J. Hubbard, Dec 7, 1926, 242/118.8 - Textile Mill spool uses sheet metal over wood. The wood Spool is also marked Essex Wire Corp. Detroit Mich. The round yellow paper is printed Essex Wire, Anaheim, California and has "Single Cotton Enamel" # 16 and that's the wire on it. The enamel is a dark color. The single cotton thread is made up of about 16 strands twisted together and the diameter of that bundle is about 0.013". The blue stuff on the inside face is that same stuff that was on the outside and really looks gray, maybe like this spool was near a grinder and is a combination of stone and metal dust. It wiped off so now hopefully it can be handled without needing to wash you hands. So what good is all this? It means that given a source of known rotational speed (an electric drill, or drill press if you have one), you can compute Ke for a given motor (clamp the motor shaft in the drill's jaws, measure the resulting open-circuit voltage, then do the math). 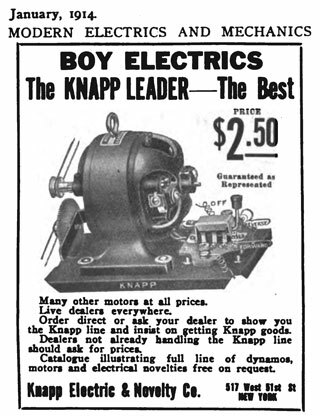 Ke, along with the above information will then give you Kt (so you can compute your motor's theoretical torque at any given current), and Kv (so you can compute your motor's maximum speed at any given voltage). If you can measure stall torque, you can then compute motor efficiency (measured torque expressed as a percentage of the theoretical torque). The above web page is aimed at permanent magnet DC motors that can act as generators. 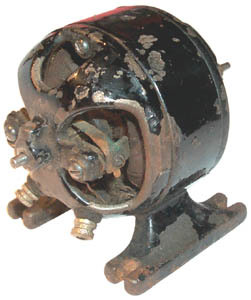 This motor when spun by hand only generates about 50 mv with the field series connected with are armature.